At the age of 85, advertising legend, Jacques Séguéla, who claims that his English is French, continues to serve as a creative consultant and a member of the Havas Global Creative Council. In an interview with Campaign, during his recent visit to India, Séguéla has many words of caution and sagely advice to a world dominated by technology. It’s rare to meet an advertising legend. It’s even more rare if you happen to meet one on the eve of his 85th birthday. 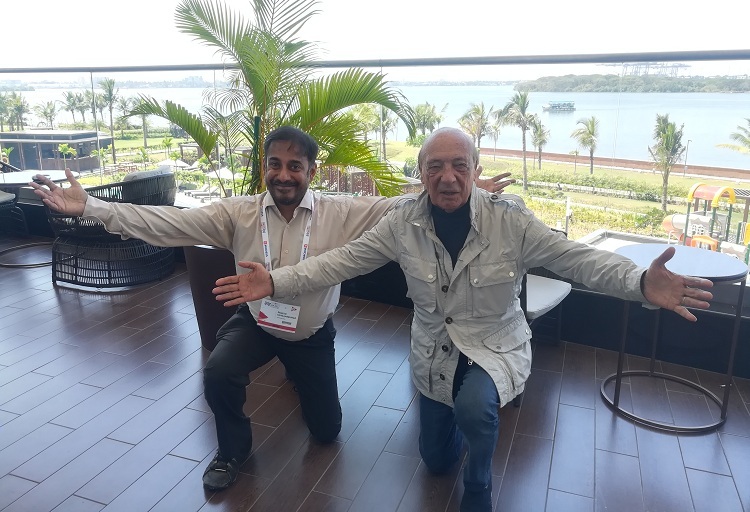 Jacques Séguéla, famously known as the S of french advertising major RSCG (Roux Séguéla Cayzac Godard) and one of the most charming advertising men one could meet, floored the audience at IAA World Congress in Kochi, when he went down on his knees as the 1000+ members in the audience gave him a standing ovation and sung a happy birthday song in advance. In an exclusive interview with Prasad Sangameshwaran of Campaign India, Séguéla who fell in love with India when he first came here 60 years ago, says, “it’s time for India to invent the advertising of the future”. "As we go digital, we must take care not to become numbers, losing the essence of humanity," is his word of advice. Humanity is not a piece of data, it is a subject and let us not turn it into a currency, he says and adds that ten years ago, McCann Japan developed the first AI Creative Director. “We are all waiting for their first Lion,” he says, giving a broad hint at the failure of tech to be creative. “Let’s not be fooled by this digital world, we need to approach ArtificiaI Intelligence, intelligently,” he says and gives an example. A Miss America jury decided to replace the traditional jury members with AI. Result: all the black candidates were eliminated. Technology must not replace humans. Let's refuse the all-tech mindset that is invading our world. Let's be hybrid. Tech without affect is nothing but the death of humankind. Tech without ideas is nothing but the death of advertising. Tech is the new typewriter, but without a writer, there is no typewriter. Human Creativity is the writer. You have been in advertising for 55 years now. Do the old rules still apply? We think advertising is a mirror of society. Wrong. Advertising is actually a mirror of the trends of humankind. When we make a campaign, it takes two years for the message to enter the consumer deeply. The big task of advertising is to repeat, repeat and repeat. It’s not just creativity but re-creativity. Repeat and repeat, but in a refreshing way, to retain the attention. When you have an idea, it’s not an individual idea. We make a baby and then another and it’s like a family. That’s the progress of humanity. So we have to mark our immortals. There is a beginning for advertising, but no end. For me this is the time of India. If you look around the world, Europe is dying. Maybe, Brexit will kill us. If you look at Africa, people call it the continent of the 21st century. Wrong. Africa is still rooted in corruption, dictatorship. All of this is bad for business. It’s too early. Maybe, the next century will belong to them. If you look at America (South America and North America) are regressing from democracy to dictatorship. It’s crazy. And when they fight, they will take on China. The interim is going to be the time of India. Why, because, the values of India like sharing, generosity, feminity are all trends for millennials. India is the biggest democracy in the world. It’s time for this country to invent the advertising of the future. And the advertising of the future is to start from the heart and go straight into the heart. Advertising is becoming advertainment and it’s a big change. With Vivendi, we are building the first global content agency. Be it the content of TV (Studiocanal) or music (Universal) we are global leaders. Now with all of this coming together, we are the biggest network providing advertainment. Martin Sorrell says (on the previous day at the IAA World Congress) that post the Vivendi acquisition of Havas, all that remains is only Vivendi and no Havas. How do you respond to that? The future is Vivendi. And the past is Martin Sorrell. I call Martin Sorrell, Sir Dollar. Money has no idea. Only idea makes money. You can buy a lot of technology and it costs a lot of money. But in a decade that technology turns obsolete. You need to invest more money, for more technology. Look at WPP and they have made this error. Tech without affect is the death of humanity. Tech without idea is the death of advertising. We need to be hybrid and bring technology and creativity together. That’s not the way WPP or Publicis are working. They just keep going towards data and more data. They say the new media is in data. Wrong. The new media is in idea. Data without an idea is like a gun without any bullet. What has been the high point of your career over these decades? It’s tomorrow. It’s tomorrow morning. What is the past. It’s nothing. You just have nostalgia of the future. How does the nostalgia of the future look like? It looks hybrid. Like tech plus creativity, it’s roots plus future, feminity plus virility. That’s exactly like India, which is philosophy and reality. Movies and news. Advertising needs to do that to make this marriage. We must escape from the fast-food of depersonalisation. We must escape from totalitarism of the tech attitude, force it to accept the mix of algorithm and human rhythm, inventiveness and sensibility, numbers and poetry. Creativity is to selling, what eroticism is to love. It ensures consummation. Technological overkill must not kill the need for every brand to create a romantic, almost carnal, relationship with the consumer. And this has to be a love marriage and not a money marriage. Sir Dollar makes money marriage. I make love marriage. You also spoke about your personal life where you have had a long love marriage with one wife and five children and not the other way around. But advertising is mostly all about five wives and one child. How do you manage that conflict? No, no, no. Our clients are not our wives. They are our children. Brands are our babies. We are the creator of baby ideas and these babies become an adult brand. Earlier this year Mark Read, CEO, WPP spoke to Campaign about moving from the cottage industry to the industrial age. But Havas with its village concept still seems to be in that cottage industry era. Your comments. In the 20th century, creativity was the number one priority for advertising. In the 21st century, media has become the number one. We need to put all of them together. We were the first agency group to do that. Now everybody tries to do that. We create a village as there are multiple functions and all service providers are put together, which is a priority. WPP and Publicis can never do that. It's too late. The 'Power of One' by Publicis is just a slogan. It's not real. They don't have one village in the world. They are too big. A big village is an ugly city. We are a small village in the ugly city. To WPP, I just say one thing. Good Luck. For me it’s exactly the opposite of what Read believes. Why? Industry is all about machines. Machines is robotification. Do you want advertising made by robots? McCann Erickson tried to do that in Japan. Creativity is human and not robotic. AI tried to make campaigns. But the campaigns are nothing. The thought that millennials don’t like advertising is a wrong assumption. They don’t like bad advertising. If we create a good idea the millennials will share it on social media like they did with our Lacoste Sport ad that had millions of views in a week. In Artificial Intelligence, disruption is a failure. In human intelligence, it is an Idea. You can have technology in the media, as you can sharply target customers. In the past, we bombarded customers with ads. If we needed to touch one million customers, we would target 10 million of them. Now we use drones to sharply target customers individually. That’s fantastic. But customers are not seeing the idea, if there is no heart and human touch. Life without passion is death. Nothing great is ever achieved without passion, and advertising is only great when it is driven by passion. A passion shared between the client, the adman, the consumer. Passion transforms. It transforms fear into courage, immobility into progress, pessimism into optimism. Optimism invented planes, pessimism invented parachutes. Let’s fly high and think differently, spend differently, communicate differently, live differently. The big chance of my life is not my books, my ads, my presidential campaigns, my agency. The big chance of my life is love. On the eve of your 85th birthday, what is your message to the Indian advertising fraternity? Invent the advertising of the future. It’s your roots, your ancestrality. Your ancestrality is your religion. Your religion is creativity. The world needs that. Fight against the dictatorship of technology and put the democracy of creativity on top. That, for me, is the future of Indian advertising. What would you like to be remembered as? As the last clown who was happy in the world.